10:00 a.m. to 12:30 p.m.
Join TLGV and members of the Finnish American Heritage Society for a fascinating program at Finnish Hall in Canterbury. 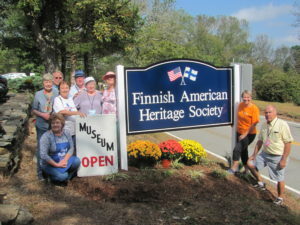 During the program we’ll learn about the Finnish American Heritage Society and their efforts to sustain Finnish American culture as well as have a discussion with Q&A about their ongoing programs. We’ll also tour their museum and library, enjoy demonstrations of wood carving, birch bark weaving, and Kentele music on a traditional Finnish stringed instrument. And we’ll sample traditional Finnish foods like pulla (coffee cake).